The web thrives on diversity. It’s the diversity of the web that sustains it and it’s the thing that will mean it’s still around long after all the monocultures, whether they be browsers or Facebooks or Googles, have long since vanished from the online ecosystem. Firefox 43 was recently released. Once installed I noticed that when I start to type a url into the Awesome Bar it asks me if I want to improve my experience with Search Suggestions. Many search engines (including Yahoo, Google, Bing and others) provide search suggestions, which are based on popular searches other people make that are related to a word or words that you enter. When Search Suggestions are enabled, the text you type into the search box is sent to the search engine, which analyzes the words and displays a list of related searches. This is one of these things that is useful on a phone but probably more trouble than it’s worth on the laptop. I tend to use the Awesome Bar to quickly search my browser history (to the point that I no longer bother bookmarking anything), so adding search suggestions would probably be more confusing that enlightening for me. Still, it’s easy enough to switch it on and off again, so there will be no problem if I change my mind. Firefox 31 hit the Arch repos at some point today and now I have it. Since Mozilla moved to their 42 day release cycle, most of the changes from one release to the next have been incremental and not really worth noting. But I did notice something new when I opened a new tab. That search bar immediately above my most recently used tabs is new. And handy. And, for the borg-averse, you can change your default search engine by clicking on the logo. This gives you a drop-down showing your currently installed search engines and an option to manage the same. I have my browser set to the Mozilla Firefox Start Page (the default, if you use Firefox). Today, the usual Firefox logo was replaced by a piece of animated awesomeness. Because, some marketing is worth seeing. I’m a little late with this one, but on March 31st, Mozilla turned 15 years old. Looking back, Mozilla’s plan was as radical as the Web itself: use open source and community to simultaneously create great software and build openness into the key technologies of the Internet itself. This was something commercial vendors weren’t doing and could not do. A non-profit, community-driven organization like Mozilla was needed to step up to the challenge. When Netscape Navigator came along, it was a piece of software that you were expected to pay for. Microsoft, sensing an opportunity, not only released Internet Explorer but also bundled it – gratis – with Windows. This, in a single step, flattened Netscape’s business and left the way open for Microsoft to start stuffing proprietary technologies into their internet offerings. If Firefox hadn’t come along when it did, and with the commitment to openness that Mozilla has maintained, we would all now be using Microsoft Internet Explorer to visit sites authored with Microsoft FrontPage and hosted on servers running Microsoft IIS. If that had happened, the web today would be a very different place in which the cost of building a web presence would be a serious barrier to the sorts of innovation we have become used to over the past 15 years. We all owe Mozilla a debt of gratitude and the future is bright. Firefox 20 is out now and I, for one, am looking forward to seeing what Firefox OS does to the mobile market. Being able to right click on a web page to take a look at the source code is handy but the Firefox source code viewer is a bit limited (not surprisingly really – it is just a viewer after all). Inevitably, then, there will come a time when you want to do more than just look at the source and will, therefore, need to get it into a proper text editor of some sort. You could, of course, just copy and paste but there is a better way. You can bring up the Firefox configuration options by entering about:config in the Awesome bar and then search for view_source. That said, the t-shirt is a very nice one and Mozilla’s ongoing support for open standards and open technologies makes them well worth supporting. You can order yours by clicking here. Help Mozilla build a better Web. If it hadn’t been for Firefox, chances are that we would all be looking at a closed, Microsoft defined, web right now with all the limitations and licence restrictions that woulkd come wrapped up in that. The Mozilla Foundation, who develop and distribute Firefox, are still going and still working to build a better web. 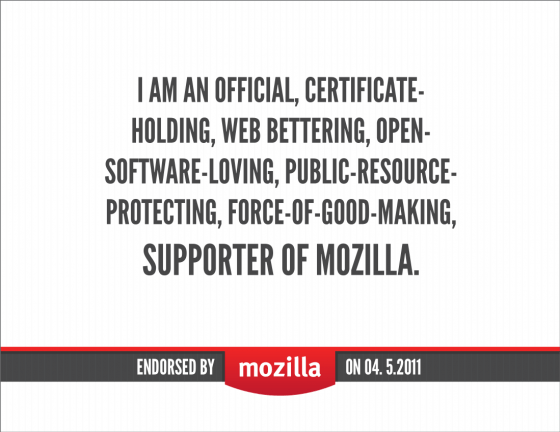 You can support them by Joining Mozilla. Not only do you get to feel warm and fuzzy, you get a freee t-shirt as well. Thanks to @corenomial for the link. I have found, after I’ve been using Firefox for an extended period of time, that it slows right down and starts to become quite a bad memory hog.